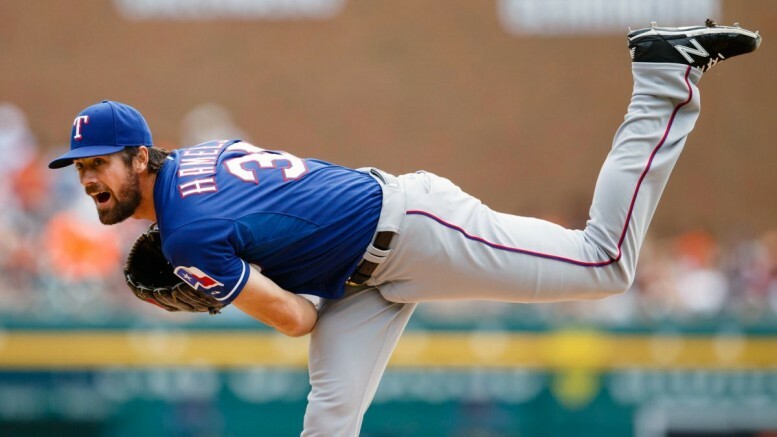 Cole Hamels is 9-1 with a 2.60 ERA for the first-place Rangers. It’s not logical to jump to conclusions on April 20 about any teams in baseball. However, even just a few weeks into the 2016 season, it’s becoming evident that several divisions are not up to par. That is certainly the case with the American League West. Last year, we were on the edge of our seats until the final day of the season, with the Texas Rangers, Houston Astros, and Los Angeles Angels all vying for the crown. But things aren’t looking so rosy in 2016. Texas finally seems to have its sea legs under it, and it figures to get even stronger once Yu Darvish returns from Tommy John surgery. But what’s going on with the rest of the West? The Houston Astros were a chic World Series pick, but out of the gate they look like a team wilting under heavy expectations. That is certainly new for Houston, a team coming off its first playoff appearance since 2005 just six short months ago. At 5-9, the Astros have plenty of time to right the ship, but their two biggest sore spots from 2015 are resurfacing. The bullpen ranks 26th with a 5.00 ERA, and the team is second in the majors in strikeouts. After the Lone Star State, the rest of the division drops off drastically. Okay, so the Oakland Athletics are 4-0 on the road and a respectable 7-7 overall. But let’s get real. This is a team in an eternal state of either rebuilding or transition. As usual, GM Billy Beane made a few savvy, under-the-radar moves this offseason (Ryan Madson, Khris Davis), but the team lacks any offensive punch. The A’s are tied for 27th in runs scored and 26th in home runs, something that isn’t likely to change much throughout the season. What about those trendy Seattle Mariners? A year ago, Seattle fell short of everyone’s expectations, and it isn’t looking much better in 2016. GM Jerry Dipoto swung a few offseason deals that they jury is still out on, but dealing reliever Carson Smith for engimatic starter Wade Miley looks like a flop. Seattle is struggling offensively out of the game, particularly at home. The M’s are 1-5 at Safeco Field, having scored a grand total of 11 runs in those six contests. And last and most certainly least are the Los Angeles Angels of Anaheim, California, USA, North America. The California-then-Anaheim-then-LA team is about as uninspired as its ever-changing name. It’s a shame for a truly elite player like Mike Trout, who is not likely to win his first career playoff game this year. The Halos rank in the bottom 10 in runs scored and bullpen ERA, two areas of concern heading into 2016. There is very little depth behind the stars, and manager Mike Scioscia just has to hope his rotation can tread water with C.J. Wilson on the shelf. Be the first to comment on "MLB Divisional Power Rankings: AL West Fading"